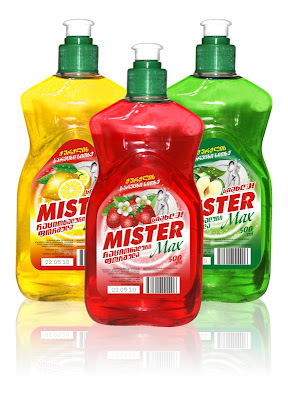 Art & Design: That's MISTER Max for You! That's MISTER Max for You! In A Quick Rinse done last year I introduced MAX, a new brand of detergents from "100+1" -- my very first detergent customers. Guess what -- MAX is back! Only he's called MISTER Max now. Besides the name change, the container was also replaced, so I had to make a new outline to fit the depression in the plastic vessel. Also, strawberry was added to the three existing flavors. 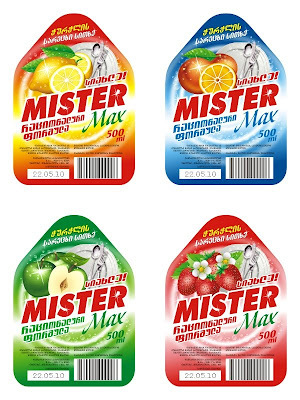 The new design maintains the general direction of the original MAX labels, but there are certain differences, mostly brought in by the changed brand-name and the different shape. But that wasn't all for Mr. Max. 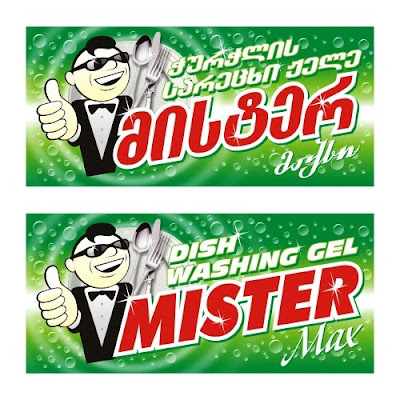 In fact, the most interesting part started right after finishing those labels, because now I had to design a mascot for another product under this brand -- a dish-washing gel also called MISTER Max. 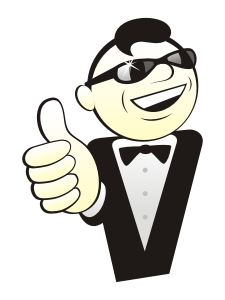 I usually draw my mascots by hand and trace them digitally afterwards, but this one has been assembled in CorelDRAW from the scratch. He looks more like a Man in Black (right before erasing your memory with a Neuralyzer) than a detergent mascot, but I think he's still does his job as a "detergent barker" good enough -- you can see him in action below. That's it for now, but I'll be back shortly with a couple of little heartbreakers. No idea what I'm talking about? Good! Stay tuned and you'll be the first to know.